It’s that time of the rugby season when the Super Rugby pauses for a while and we get a few international matches. Wales and Scotland are due to make short visits to South Africa later in the month but the first fixture for the Springboks was a non-cap game in Cape Town against a ‘World XV’. As the match was scheduled for one week after the final matches of the European season I’d initially had high hopes that Jonny Wilkinson or Brian O’Driscoll might make the trip for one last game before retirement. They didn’t though. In fact, I didn’t even see any speculation that either of them might make an appearance. I’m not sure that I’d have been so scrupulous had I been the promoter looking to sell tickets. Jen and I arrived in Cape Town late on the Saturday morning, perfect timing for lunch at the waterfront. The forecast had been for snow which wasn’t something that I had contemplated when I’d booked everything up a few weeks earlier. I always expect the Western Cape to be warm and sunny. As it turned out, the forecast was wrong and the weather was just as I’d assumed it would be. Our hotel had been preserved as far as possible in the style that it had been built one hundred and twenty years earlier. This potentially caused a problem as nowadays most guests expect en-suite facilites, something that wasn’t so important in the late nineteenth century. I think I’d have just linked the bedroom to the bathroom with a door. Perhaps a Victorian style door. That’s just me though. What they had done instead was to knock a hole through the back of a wardrobe. 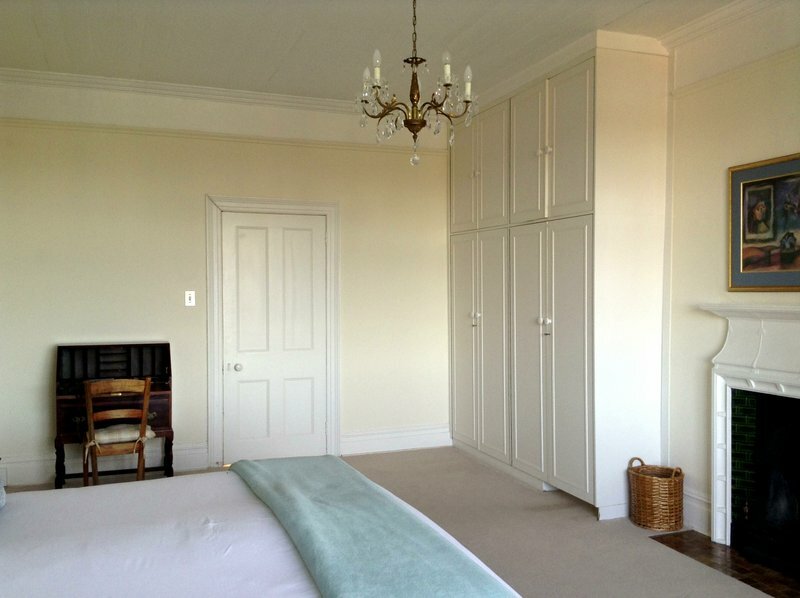 I’m glad I wasn’t busting for a piss when we arrived as I doubt I’d have thought of opening all of the cupboard doors in the hope of finding a secret passage to the bathroom. 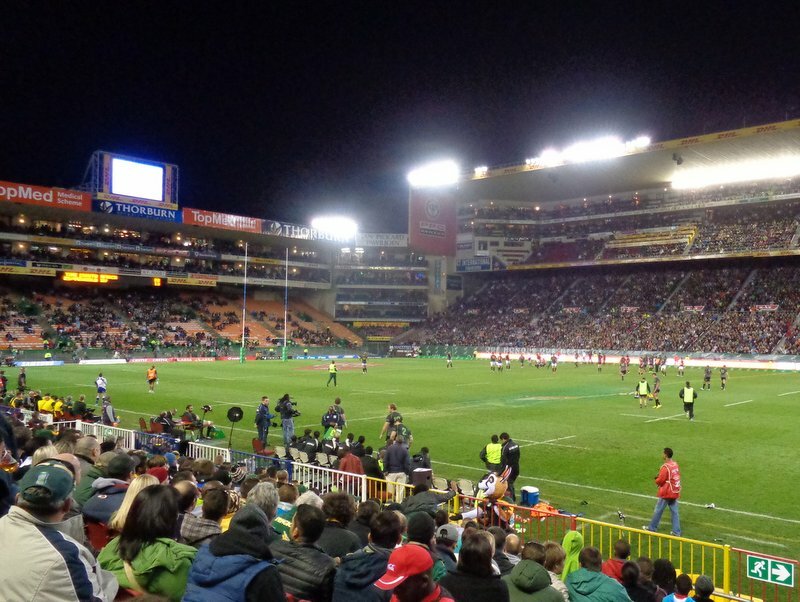 Whilst I was disappointed that there wasn’t a secret underground tunnel to Newlands stadium that you accessed via a revolving bookcase, it was easy enough to just follow the crowd ten minutes up the road. 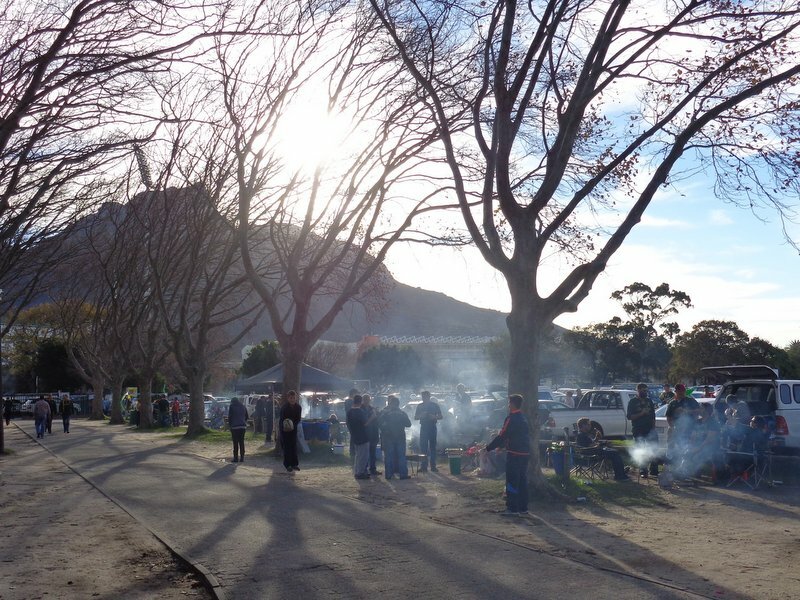 Not many of the fans appeared to be going directly to the game though, most of them being easily sidetracked by the prospect of a car park braai. We were an hour or so early at the game but without having any braai equipment of our own we went in and took advantage of the stadium catering. The temperature had dropped a fair amount from lunchtime and it was probably too cold to be drinking beer. It’s rugby though and that’s what you do, so I had a few anyway. Foodwise, there wasn’t much going on. I suppose they expect that everyone will have eaten in the car park. 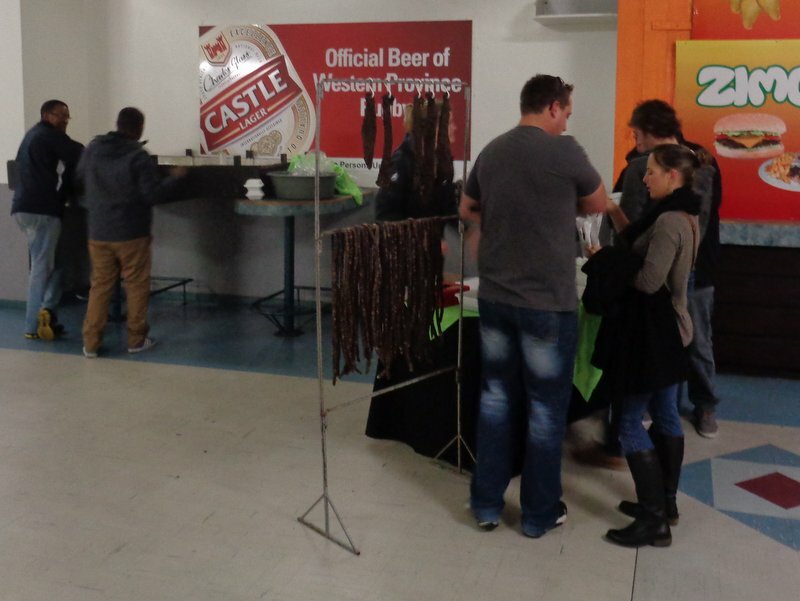 There was a biltong (dried meat) stall though that seemed to be doing good business. 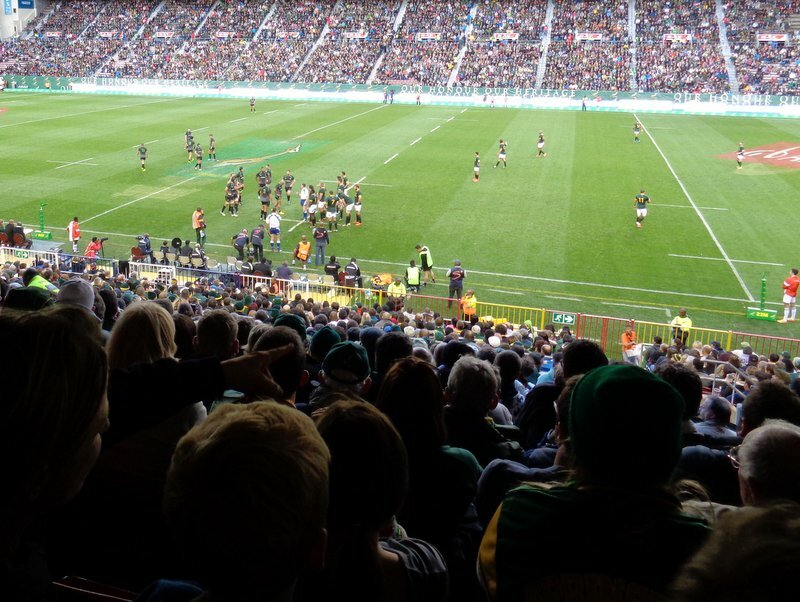 South African rugby draws most of it’s support from Afrikaners and I’ve a feeling that biltong does too. I don’t recall seeing anyone selling biltong at a football game over here. Perhaps that’s why you rarely see white fellas there, the prospect of having to eat their belt and shoes at half-time being too much for them to cope with. Better than a Wagon Wheel, I suppose. In theory our seats were decent ones. They were down the side, beyond the 22 yard line and towards the back of the lower tier. We’d even bagged seats on an aisle to make trips to the bar easier. The only downside was that we were under a low overhang from the tier above and it blocked out the view of the sky. I could still see even the highest up and under kick, but I like to see the sky too. Mind you, had the forecasted snow materialised I imagine I may have been a little more grateful for the cover. Despite the lack of sky, I liked the old-fashioned look of the Newlands ground, with stands that appeared to have been built at separate times and with a small standing section behind each set of posts. I cropped the overhanging roof out, but you can see its shadow. The World XV didn’t have many names that I was too interested in apart from England’s Steffon Armitage. The English policy of not selecting players who turn out for French clubs means that this might be the nearest he gets to international rugby for a while. He did ok, as did the rest of his World XV side early on. View from a bit lower down. 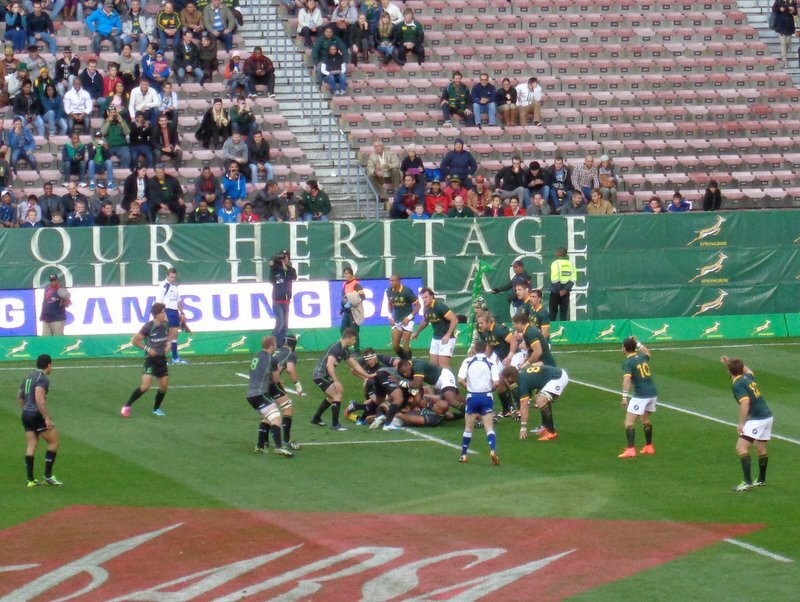 It wasn’t to last though as South Africa cancelled out the visiting side’s advantage by half-time and then ran riot after the break with another four tries in the second half. The game wasn’t of the highest quality, but that was to be expected with the minimal preparation time afforded to the World XV. Perhaps one of the Super League teams would have provided better opposition. Or maybe a northern hemisphere club for a bit of variety. How about, say, the Heineken Cup winners, Toulon? I’d have got that last Jonny Wilkinson appearance then. 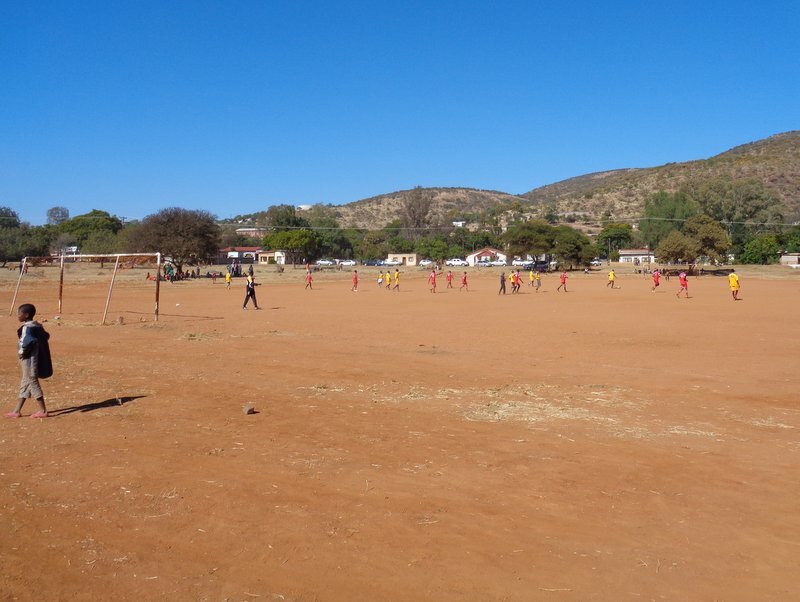 Whilst we were driving around Lobatse looking for the New Lobatse Stadium we stumbled across a game taking place on a pitch that we subsequently discovered wasn‘t too far from the ground we were after. It was a little out of town, or at least the part of town that had shops and offices. 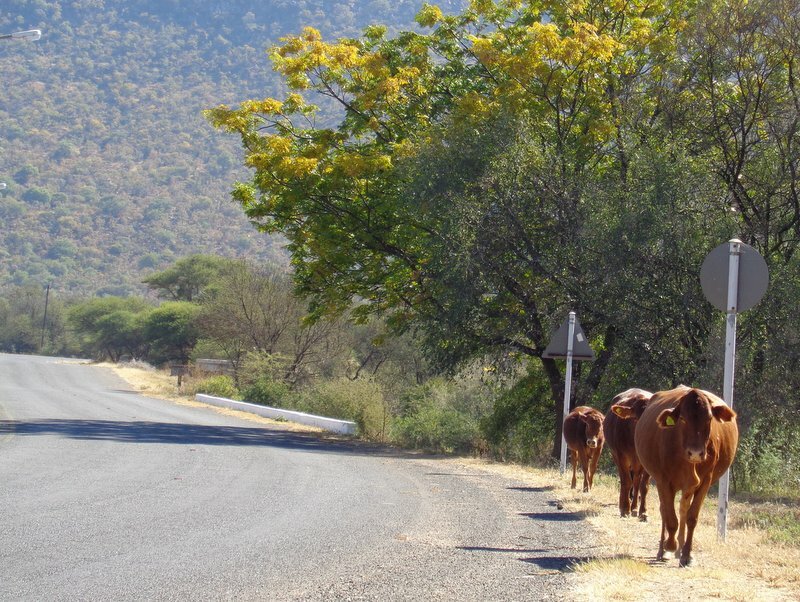 It did have cows wandering along the roads though, so that makes it the best part of town. I find it hard to drive past a match of any sort without stopping for a while and so I parked up and had a wander over. The pitch wasn’t up to much, not unless you were planning on planting potatoes, but they had nets. They also had around fifty people watching, suggesting that apart from going for a walk with the cows, there’s not much to do in that neighbourhood on a Sunday. The team wearing red had Pelenge Kicks on the back of their shirts, from which you could reasonably conclude that they had been named by Chris Waddle. I couldn’t see anything on the shirts of the team wearing yellow, so we’ll just call them Yellows. A count up of the players confirmed that it was eleven a side, but it looked fairly congested. The keeper at my end was wearing number 300 on the back of his shirt, perhaps giving an indication of the size of the squad and his usual place in the pecking order. View from behind the goal. One team scored whilst I was watching although I can’t remember which one. It was at the far end though if you want to try to work it out from the photos. I’m not sure where that goalie is. Maybe they were playing fly-keeper. There were a few kids having a kickabout behind the goal and I asked one of them if he knew the score. “Yes“ he replied, and left it at that. As I was leaving one of the other kids asked me if I had two Pula. That’s around fifteen pence. Tempted as I was to respond in kind with a “Yes“ of my own I gave him the handful of change that I had in my pocket, which was probably no more than a couple of quids worth. He instantly became Mister Popular amongst his mates. I’d seen an advert in the paper for a farm workers job that paid five hundred and fifty Pula a month and so that loose change was about equivalent to a day‘s pay. Frightening really. I’d thought that the football season in Africa had finished, but then I stumbled across the fixtures for the first round of qualifying for the 2015 Africa Cup of Nations. South Africa didn’t feature, so I assume that they don‘t take part until later in the competition. Jen and I didn’t have anything planned for the weekend and so I had a look at neighbouring countries to see if there was a game that we could get to. Swaziland were playing away so that ruled them out. 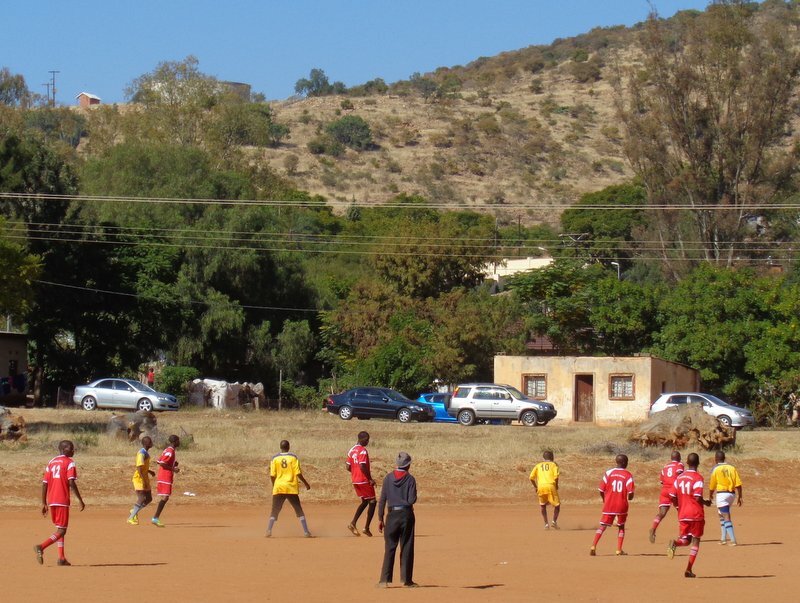 Lesotho had a home game, but the flights were a couple of hundred quid a pop and I thought that was a bit much for a game that didn’t involve the Boro. 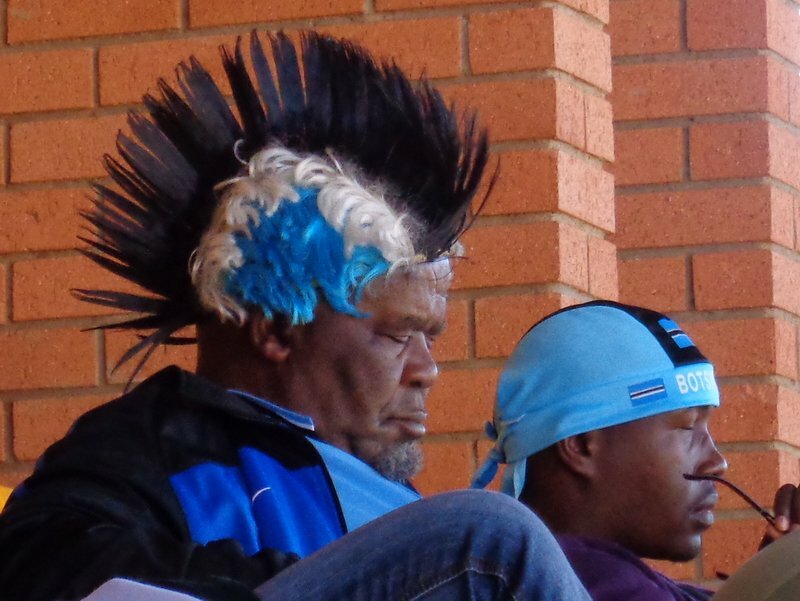 Botswana were also playing at home, against Burundi, and as the flights were a fair bit cheaper that’s what we went for. 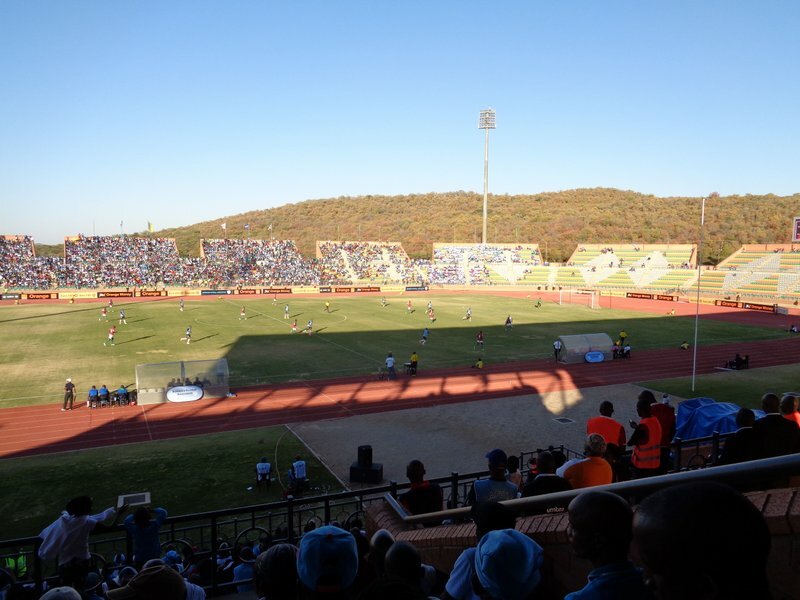 We booked a room for the Saturday night that was handy for the National Stadium in Gaborone and everything looked all set. Or at least it did until I discovered that the National Stadium had already been booked for the African Youth Games. 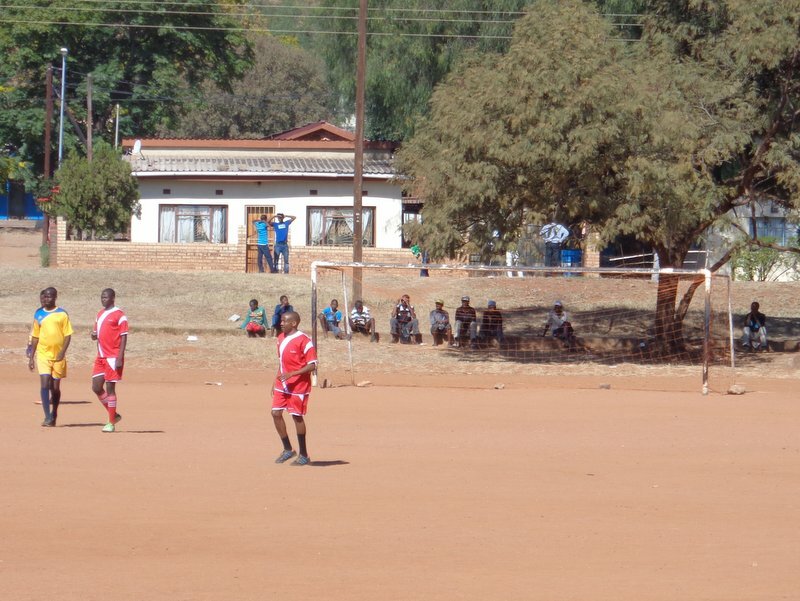 Bloody kids.The national team’s qualifying match for the Africa Cup of Nations had been put back a day and shunted seventy kilometres out of town to the New Lobatse Sports Centre. 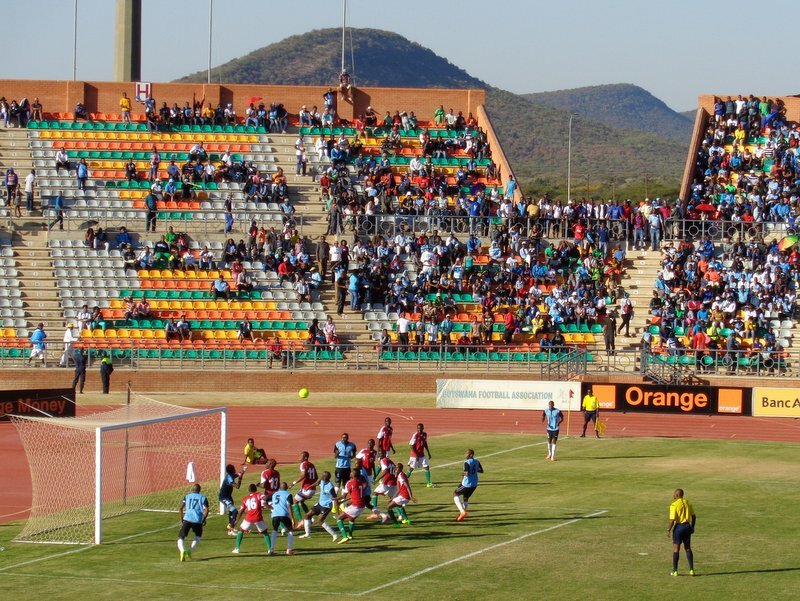 I wouldn’t care, but a similar thing happened last month to Botswana’s game with Swaziland after someone had booked the National Stadium for a car boot sale or something. You’d think that the country‘s football team would get first dibs. Still, at least there was something going on at the National Stadium. The African Youth Games appears to be quite a big deal, with fifty four countries represented by a couple of thousand participants. By the time we arrived on Saturday morning though, there were only a couple of athletics events to complete before the closing ceremony. We couldn’t park near the stadium and were directed to a Park and Ride. The bus driver told us that it would be at least half an hour before the bus would set off and so as it was only a ten minute walk back to the stadium we left him to it. The stadium looked fairly empty as we approached, with no one going in other than gangs of teenagers in matching tracksuits and accreditation around their necks. A security guard told us that the only way to get tickets was by finding a particular chain of supermarket and buying tickets there. As we weren’t too fussed about catching the under fifteens three thousand metre steeplechase we gave up and had a wander around the market that had been set up nearby instead. 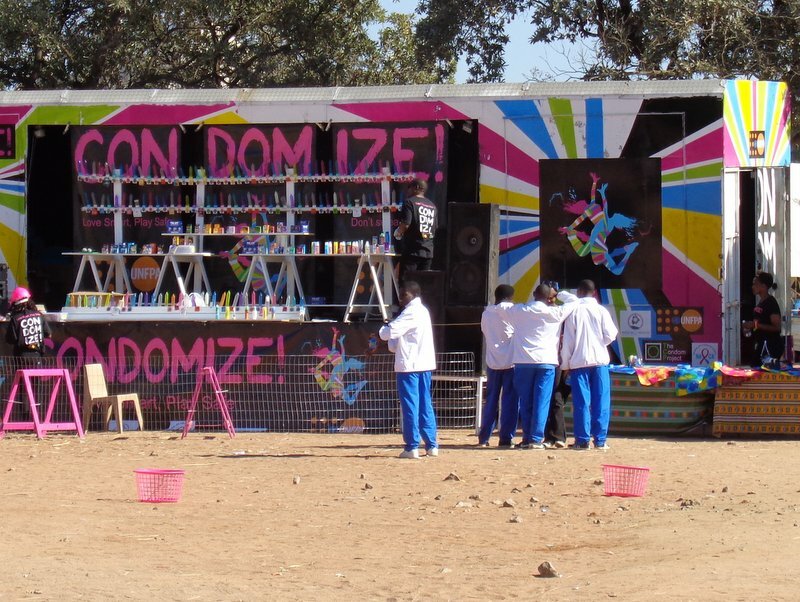 The condom shop seemed popular. I don’t think that many of the stall holders had made the killing from the games that they’d hoped for. Ticket sales to the public were poor and a couple of thousand teenagers on a trip away from home are more likely to nick your stock than pay for it. I couldn’t help but admire a suit that had a strip of animal hide running down the spine of the jacket with more skin decorating the front pockets. 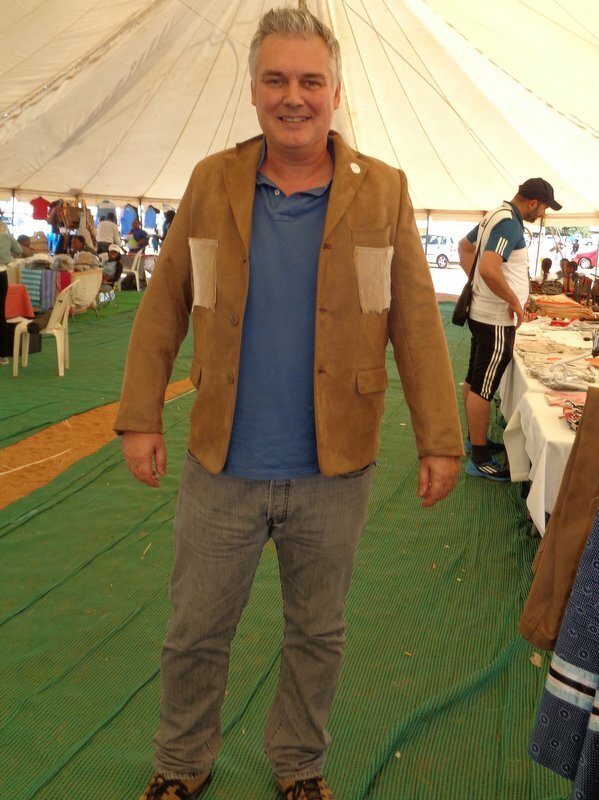 I knew that it wouldn’t fit and even if it did I’d struggle to find the right occasion to wear it to, but when the bloke selling it suggested that I try it on I didn’t need to be asked twice. If only it had been made entirely of zebra hide, I’d never have taken it off again. 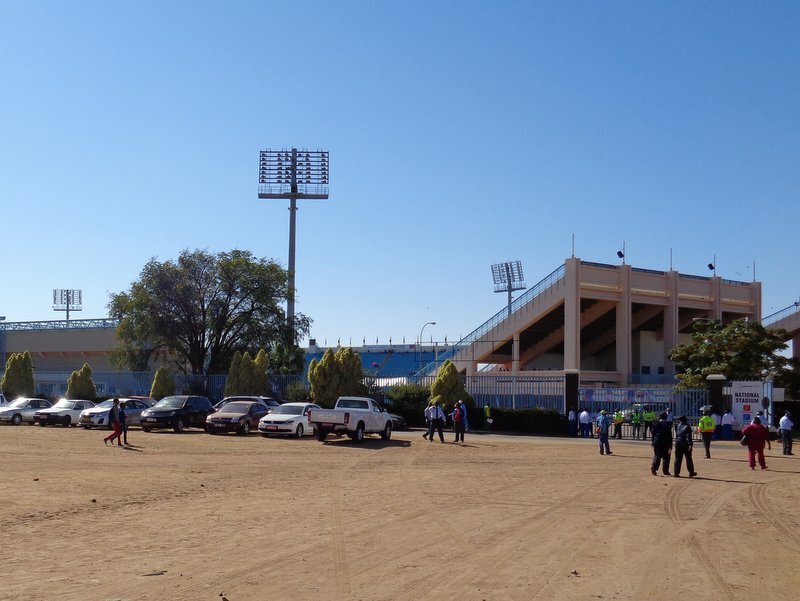 With a day to go until the Cup of Nations qualifier we had time to make sure that we had match tickets in advance and so we popped into Gaborone town centre. It seems a safe enough place, although we were targeted by one of those fellas selling paintings to fund a day care centre for one legged orphans. We’ll be able to open our own gallery one day. 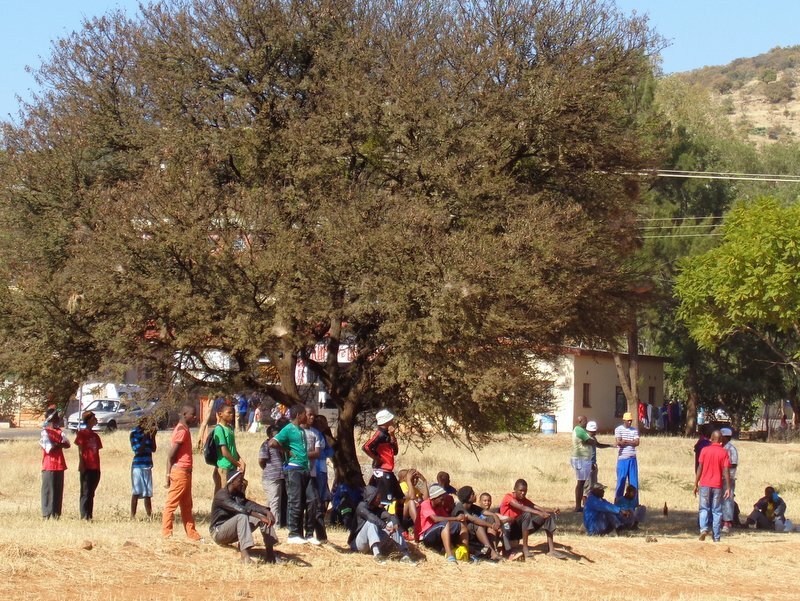 I’d read that the match tickets were being sold at Orange shops and so once we’d found one it was easy enough to pick up a couple of fifty Pula seats for the shaded stand. In case you’ve never seen a ticket before. We’d booked into a backpacker’s hostel, mainly because it was right next door to the Mokolodi Game Reserve where we’d intended to track rhinos on foot. Unfortunately the rhino tracking was the last thing in my list of things to arrange and they were fully booked. 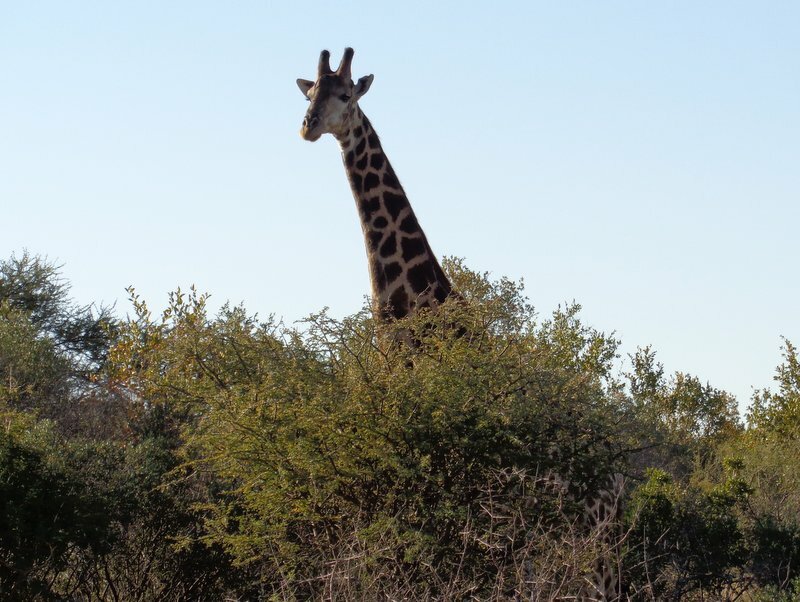 As we were staying nearby we visited the reserve anyway and settled for a two hour game drive instead. We still didn’t see any rhinos. There were a few giraffes though and as we were driven around I quietly dropped the raisins from my complimentary bag of nuts and raisins for the warthogs to eat. That bush doesn’t provide much of a hiding place. I noticed an advert in the paper the next day for some of the livestock on the reserve. It certainly beats your standard gift shop, although we’d have struggled to have got any of them on the plane back to Johannesburg. They’ll even gift-wrap them for you. The hostel was ok, mainly because we had the best room, one of those roundel things with a thatched roof. 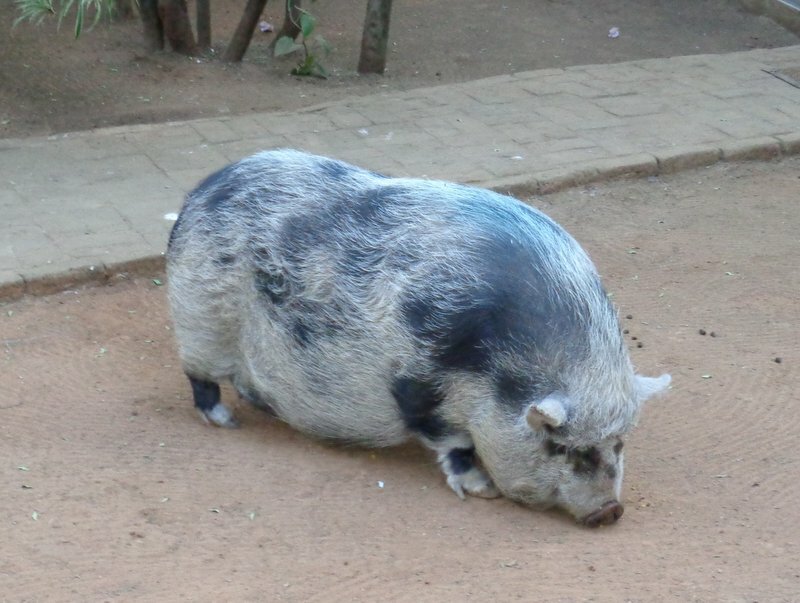 As well as having the only en-suite bathroom on the premises it came complete with peacocks and the fattest pig I’ve ever seen. I can only hope she was heavily pregnant as dragging your stomach along the floor isn’t a good look. Despite that, we fed her more leftovers than I suspect is healthy. Next morning we drove down to Lobatse. 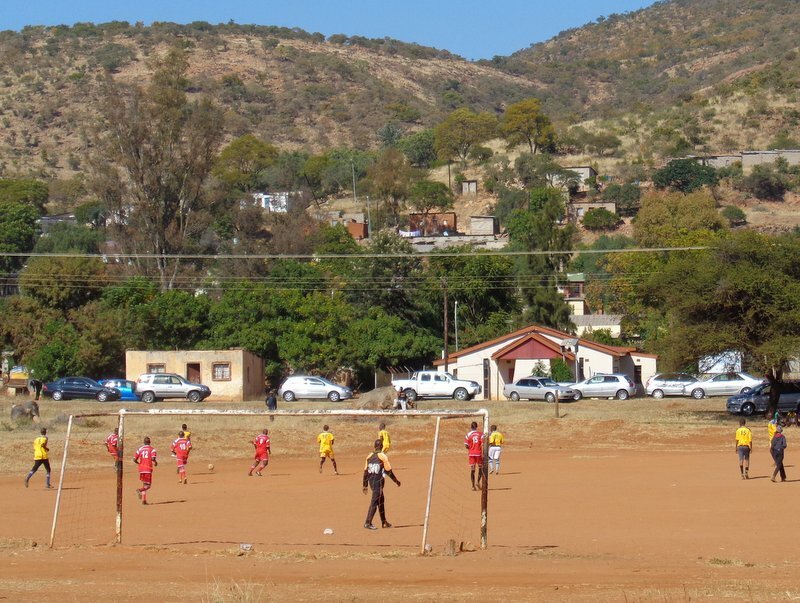 We’d planned to call in at some game reserve with vultures but couldn’t find it and so spent most of the morning driving around the town looking for the stadium before stretching out our lunch long enough to read every section in a couple of Sunday papers. 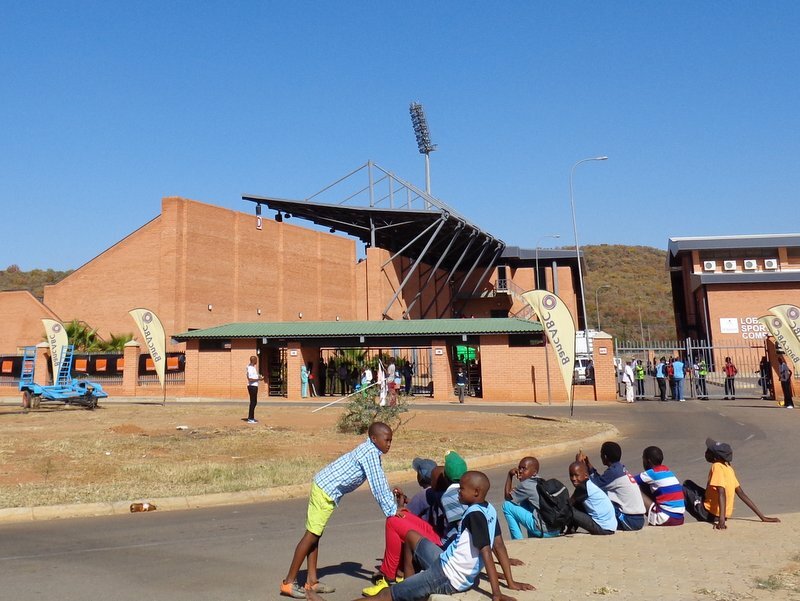 The upside of having not much to do was that we got to the New Lobatse Stadium early enough to get a prime parking space just outside of the turnstiles. The downside, however, was that we had almost two hours to wait until kick-off. We were in the only covered stand and were able to take our pick of the seats to the left of the central VIP section. It’s a nice enough ground in a modern sort of way, the best feature probably being the hills in the background. As kick-off neared we were treated to a dance trio. 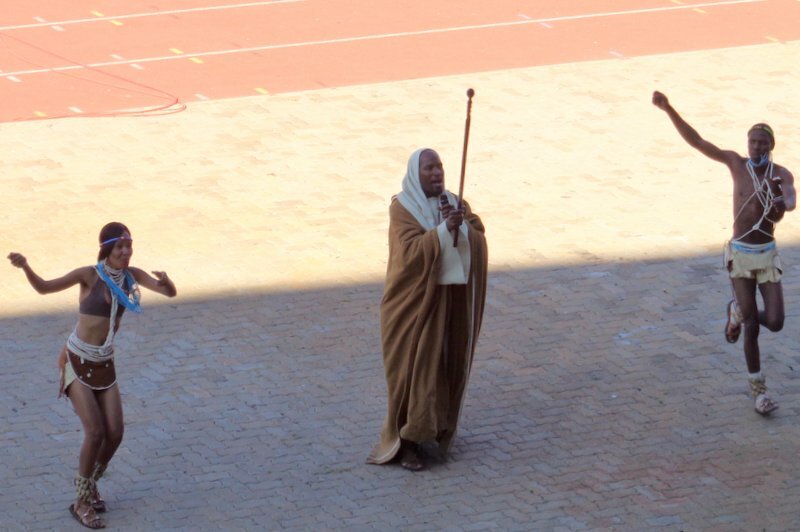 They roped in someone who looked like a bigwig in the FA at some point and he added to the entertainment by playing air guitar on the stick that the bloke with the robes had been wearing. You don’t get that at The Riverside. By the time the game kicked off I’d estimate that there around five thousand fans in the stadium. As ever, they kept arriving throughout the first half and probably a bit beyond that. One of them had brought what looked like a full-sized stuffed zebra. 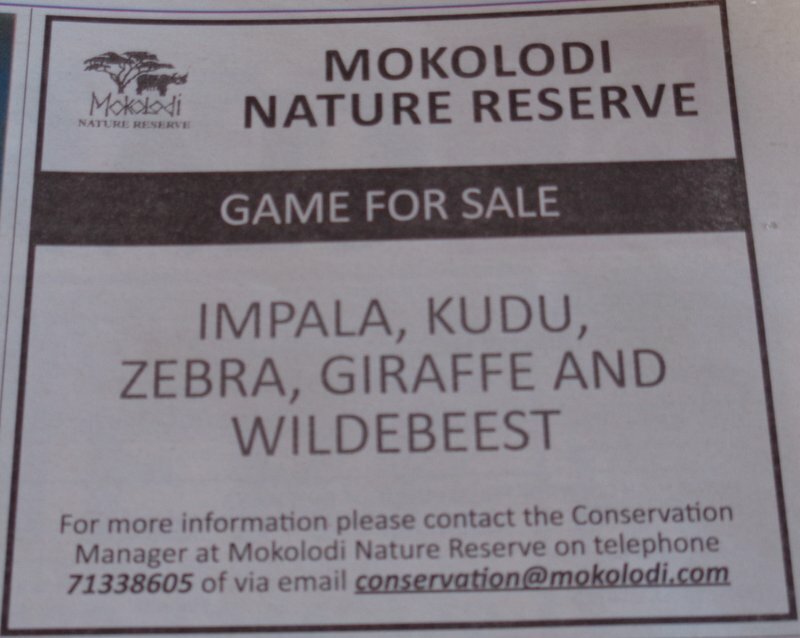 Perhaps he’d picked it up from the Mokolodi Game Reserve. The standard certainly didn’t seem like an international match with plenty of tackles flying in early on that missed both ball and man. The game was finally balanced at nil-nil after the first leg and it stayed that way throughout the first half, with just the single shot troubling the away keeper. We had to leave at half time as the change of date meant that we’d have struggled to have caught our flight otherwise. 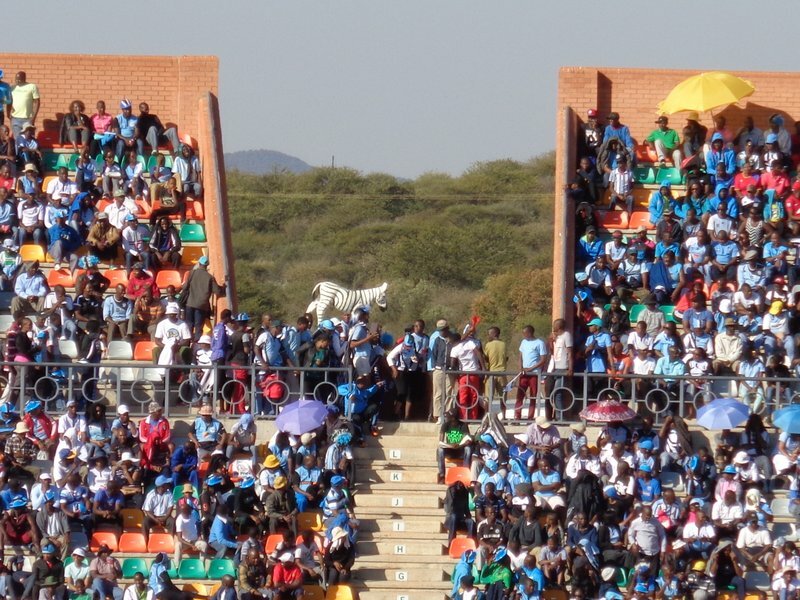 Our quick getaway meant that we missed the Botswana goal that clinched their passage into the second round and a tie with Guinea-Bissau. Who? No, me neither. If the National Stadium isn’t already booked for some kid’s birthday party we might very well head back and see how they get on in that one.